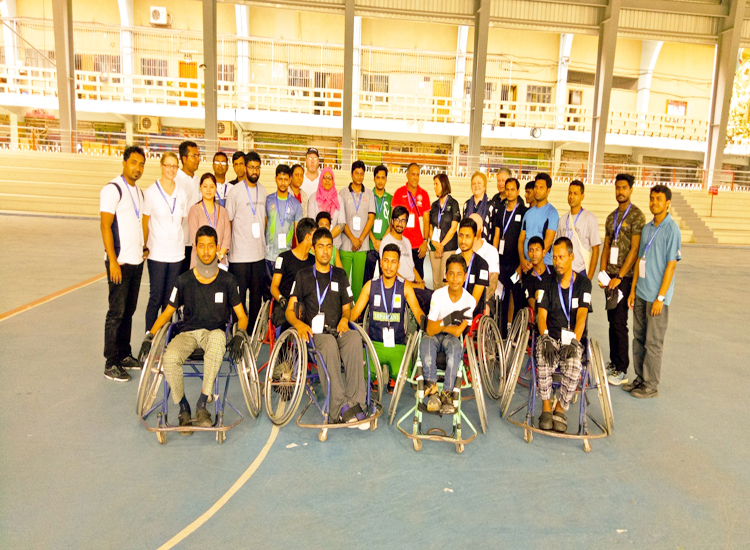 International Wheelchair Rugby Foundation (IWRF) ran a four day development clinic programme in Bangladesh. It began on April 8, 2017 at Sheikh Russel Roller Skating Complex, Bangabandhu Stadium, Dhaka. The program was initiated by Disability Sports Australia (DSA), and supported by the Australian Government’s Department of Foreign Affairs and Trade (DFaT). The principal sponsor in Bangladesh was Chowdury Shahabuddin Ahmed in partnership with the Centre for Disability Development (CDD) and Sports for Hope and Independence. A team of ten officials, including a doctor, therapists, a referee coach provided logistical support, whilst ten spinal cord injury patients from the Centre for the Rehabilitation of the Paralysed (CRP) took part in the clinic as trainees. Thus, the total number of attendees was 20 from CRP. The four trainers,Katie Bourke (Australia), Curtis Palmer (Australia), Jon Corson (New Zealand), and Sholto Taylor (New Zealand) are internationally recognized experts in their fields. The four day clinic covered both theoretical and practical training topics ranging from the History of Rugby, Recruitment, Volunteers and Costs to Game Play Theory, Game Management, Introduction to Classification, and Referee Mechanics and Coaching.